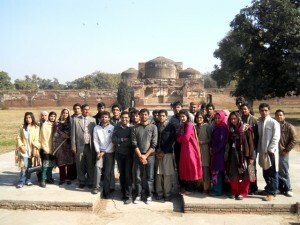 The Griswold History Society (GHS) organised a trip to historical places in Lahore on 28 January 2012. The group consisted of about 40 students and four professors from the Departments of History and Biological Sciences FCC. The day began with a trip to the mesmerising Wazir Khan Mosque, built by a courtier of Emperor Shah Jahan in 1635 AD. The visit was followed by a traditional breakfast, courtesy of an old Formanite who lives in the area. The trip then continued to the Gurudwara Dera Sahib and the Samadhi of Maharaja Ranjit Singh and the famous Sher-e-Punjab, near the Royal Fort. Then followed a quick tour of the Diwan-e-Aaam, Diwan-e-Khas and Shish Mahal in the Royal Fort which gave the students an awe inspiring taste of Mughal architecture and life. Continuing the Mughal theme, the group then visited the tombs of Empress Nur Jahan and Emperor Jahangir in Shahadara, just outside Lahore. The imposing tomb of the Emperor who loved Lahore so much, and the lush gardens surrounding it gave the students a perfect opportunity to unwind and have lunch under the shade of its numerous centuries old trees. The trip ended with a visit to the Wagha Border Post between India and Pakistan for the flag lowering ceremony. Seeped in British traditions of signaling the Last Post and the lowering of the flag at the end of the day, this adapted ceremony is a daily reminder of the partition of South Asia and the continuing tensions between India and Pakistan. The trip was well organised and everyone was happy with the mix of learning, sightseeing and relaxation.